Courier mail is used for official state government mail between state agencies across the state, as well as city, county and local governments, and universities outside of Wake County and is delivered to a predetermined drop box. Designated users are provided with a key to the drop box and can deposit mail or retrieve mail daily. Courier mail is delivered at night in the central portion of the state and delivered during the day in the western portion and in the most eastern portions of the state. Courier mail is billed at the USPS rate, plus additional fees for Courier mail over 50lb. and Time Critical/Biohazard mail. There are three classes of Courier Mail. Courier mail is billed through our Fiscal Office through the Courier Service billing system. When addressing Courier mail, please be sure your return address with your courier number or MSC number is in the upper left hand corner of your letter/package and that you have the recipient Agency Name and courier number or MSC number listed in the center of the letter/package. Please be sure you have attached a Mail Service Center Mailing Form with a valid barcode number on the form to go along with your outgoing mail for processing. You can bundle all your courier mail with one mailing form. All mail types should be individually grouped with a mailing form properly marked with the mail type. For example, all USPS mail should be bundled separately from Courier with its marked facing slip. *USPS First Class and Presort services are currently only available to state agencies inside of Wake County with a valid NCAS code. 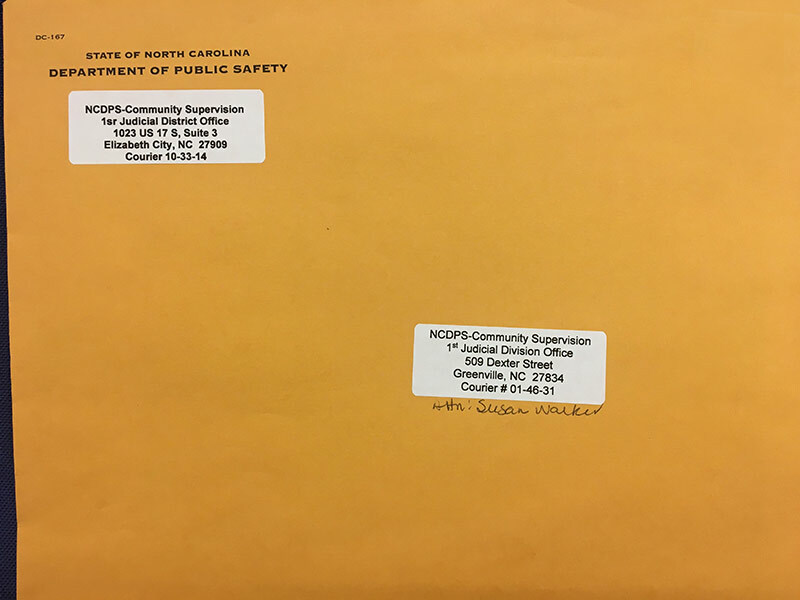 Any agency wishing to subscribe to the service should email the Mail Service Center at mschelp@doa.nc.gov. The agency should send an email to mschelp@doa.nc.gov with the necessary changes and a contact person or call the Mail Service Center at 919-733-2913. If you would like to deactivate your courier account and no longer use the service, please send an email to mschelp@doa.nc.gov or call the Mail Service Center at 919-733-2913.